The sanctuary has duration of life from the early archaic up to the hellenistic season and its history is connected with two ancient cities of the region, Sani, colony of Andrions and Ouranoupoli the city that Alexarhos founded in 315 B.C., brother of the king of Macedonia Kassandros. In the end of the 6th century B.C. Alexarhos and the residents of Sanis founded the sanctuary except for the walls of the city and built the house on representation. In the end of the 4th century B.C. Alexarhos founds Ouranoupoli and includes the sanctuary in the new city. In his building program are included monumental manufactures, the hellenistic temple, the repair of the archaic house e.t.c. The sanctuary was abandoned in the 3rd century B.C. The archaeological research began in 1990 when during the autopsy there was found an afterarchaic anthemical edge tile and an octahedral vessel. 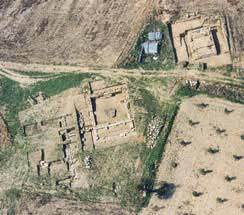 In 1990 during test sections, there were located parts of the archaic house and the hellenistic temple. In 1992-3, the house was digged up, while in the same year also began the excavation of the temple which was continued and in 1994. In 1995 the excavation was characterized as systematic and in 1996 also began the excavation of the group of the hellenistic buildings at the south of the temple. The most important buildings are: Archaic "house' which consists of alcove and portal on representation. It is raised on a foot made of granite (1m. height) and has chalky walls. The most interesting discovery of the building were the earthen Corinthian pantiles of the roof and the capes. Hellenistic temple. It consists of a portal and alcove with three entries, a built desk along the Eastern wall, bank for blood-free offers and somewhere in the middle a cluster of rocks with traces of combustion. In the portal there was found a marble head of Helium and a marble head of a girl.